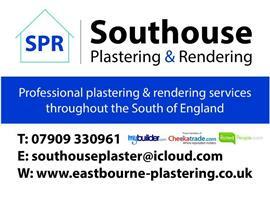 Southouse Plastering and Rendering - Damp Proofer, Plasterer based in Eastbourne, East Sussex. SPR Plastering and Rendering offer professional plastering and rendering services throughout Eastbourne and Sussex, we work for both commercial and domestic clients. Southouse Plastering and Rendering is owned and operated by Chris Southouse, Chris has many years experience in managing sites and working with all aspects of plastering and rendering. We specialise in external render systems using many different options including traditional sand & cement finishes to monocouche, silicone and acrylic renders. SPR Plastering and Rendering carry out work to the highest standards and strives to provide customer satisfaction. We pride ourselves on professionalism and punctuality. A high quality finish is not a successful job in itself. From turning up on time and keeping a job clean and organised, to being polite and helpful, right down to appearance are key to a job running successfully.